Illinois was once covered by more than 20 million acres of prairie, but now less than 2,500 acres of quality remnant prairie are left. Jamie Johannsen explores prairie’s role in the environment and restoration efforts in the Prairie State. The prairie landscape is an important part of our Midwestern identity. In the Old Northwest Territory, the story of today’s culture is bound up with the story of the prairies. The term ‘prairie’ is attributed to French explorers who trapped and traded here in the mid 1800s, and marveled at the beauty of the elegant tall grasses. A prairie is an ecosystem dominated by native grasses and flowers. Very few shrubs survive in these areas, and even fewer trees. When the pioneers arrived, they assumed that the prairies were unproductive lands unable to support the tall trees of the eastern forests they were familiar with. The prairie’s thick layer of sod, matted roots and clingy soil challenged pioneer plows. Once the early pioneers succeeded in breaking the prairie sod, they soon discovered that this rich organic matter was the finest agricultural soil in the world. After the first bumper crops came in, these pioneers quickly built farms in this fertile paradise. By the 1890s, innovations in farming technology and the expansion of the railroads created a busy agricultural industry that plowed through, drained and replanted much of Illinois’ native prairie. Soil produced by native prairies of Illinois and southern Wisconsin now grows food shipped throughout the world. Prairie evolution and ecology remain an essential factor to sustaining contemporary land resources and populations. Prairies are composed of complex interdependent relationships among plants, insects, birds, reptiles and mammals. These species have adapted to the prairie habitat over thousands of years and many require precise conditions for survival. Many prairie plants, for instance, require a specific prairie insect, such as a hawk moth, for pollination. And many insects require common prairie flowers and grasses for food and habitat. Many of our native bird populations rely solely on grassland habitat for nesting and food. Prairie plants have very deep root systems which help to anchor soil and prevent erosion. About 70 percent of the average prairie plant is roots. Prairie plants developed these tremendous root systems, some more than 20 feet deep, to survive in the weather extremes of the Midwest. In summer, when temperatures can exceed 110 degrees Fahrenheit, and it may not rain for months, and in winter, when a Wisconsin prairie can experience minus-40 degree temps, these plants must have robust underground support systems to endure the stress. During summer droughts, the deep-rooted prairie plants draw moisture and nutrients from deep beneath the soil. Along with sustaining the plant, these root systems act as a filtration system, allowing precipitation to gradually seep into the ground and recharge aquifers. In northwestern Illinois, these aquifers are our sole source of drinking water. The roots of prairie plants also help to build and enrich the soil. One-third of the roots of average prairie grasses die at the end of the growing season. The dead roots decay into organic matter in the soil, helping to heal depleted farmland and other abused soils. The dense prairie roots act like a giant sponge, greatly increasing infiltration of rainwater into the ground. This absorbency reduces runoff and flooding, thereby preventing sediment and polluted storm water from entering streams and rivers. Today, non-native plants dominate our landscape. Almost every lawn, field and roadside is filled with alien plants from other lands and regions. In an area dominated by non-native plants, the variety of species that can co-exist numbers less than 20. By contrast, in a native landscape, the variety of species may number as high as 200. A quality, mature prairie can contain more than 300 species of plants alone. Native plant diversity means more food and habitat for birds, butterflies and mammals. “We live in the ‘Prairie State,’” notes Nelson, “but high-quality prairies are rare, and so are some of the animals that once thrived in Illinois.” One of the most widely recognized prairie animals is the prairie chicken, once extirpated [locally extinct] from the state, but it has been reintroduced to restored grasslands in southern Illinois. The Franklin’s ground squirrel is another state-endangered species that was once widespread in the Grand Prairie region of Illinois, but has nearly vanished along with the prairies. The upland sandpiper, like so many ground-nesting birds, requires short-grass prairies for breeding and nesting, but now is rarely ever observed nesting in Illinois. Rare, too, are the butterflies, such as the Karner Blue, and Dragonflies species such as the Hine’s Emerald. State endangered reptiles, such as the Ornate Box turtle, are restricted to a handful of sand prairies of sufficient size to support viable populations. The prairies of Illinois also once supported free-roaming herds of bison – a sight that now exists only in one’s imagination. Kerry Leigh, executive director of the Natural Land Institute, remembers that, when she was a child, she heard that the prairie grasses were as tall as a man on a horse. She heard stories about settlers traveling the Oregon Trail, who lost their children in those vast miles of tall grasses. As a small person, at the time, she felt intimidated. A rare northwest Illinois ecosystem is loess hill prairie. Some 10,000 years ago, the Mississippi palisades were frosted with a deep layer of fine loess creating the paradox of deep, fertile soil on the highest peaks and steepest crags. Hill prairies are associated with hills, but that’s not their defining characteristic. Hill prairies tend to be small and isolated atop steep rock bluffs or steep, rolling hills. Their inaccessible locations prevented them from being converted to cropland. Hill prairies are sometimes called “goat prairies,” because goats were the livestock of choice for these prairie openings, which were too steep for cattle to use. “The plants and animals that live there are very special,” muses Rachuy. Many hill prairies were perched on exposed limestone faces that have been destroyed by quarrying. Other hill prairies have succumbed to residential development. Illinois was once covered by more than 20 million acres of prairie. Now, less than 2,500 acres of quality remnant prairie are left in the Prairie State. Conservationists are working hard to recreate and improve prairie habitat throughout north central Illinois in hopes of bringing back the great abundance of wildlife that one inhabited this area. Rachuy calls this “putting nature back the way it was,” and that sums up the purpose of his organization. NIPE’S’ corps of volunteers help local landowners, both public and private, to protect, restore and manage their properties in an ecologically sustainable fashion. Like other prairie conservation organizations, NIPES utilizes numerous restoration techniques to not only establish, but also carefully manage and nurture recreated prairies. A newly planted prairie takes up to 10 years of intensive management before it becomes a high quality and sustainable habitat. Nelson, of the Illinois Nature Preserves Commission, agrees that soil fauna is one of the most important characteristics of an original prairie. “Insects, mycorrhizae and soil microbes interact in complex ways, in concert with the native plants of the prairie, to cycle nutrients, carbon, water and energy,” he explains. “Restored prairies on former agricultural fields don’t support a diverse soil fauna, due to decades of pesticide applications.” Although they are highly beneficial, re-created prairies can never match what nature created over thousands of years. In a restored prairie, this balance is rarely achieved. In challenging site conditions, it may take decades before rare prairie plants can become established. The encouraging news is that restoration ecologists are getting better at what they do. For establishing new prairies and reseeding young prairies, restorationists cite several advantages to collecting seed. Although collection is often painstaking work, prairie seed that can be harvested by hand provides what may not be readily available commercially. Also, the seed obtained from a supplier may not be genetically suitable or appropriate for the restoration site. The Winnebago County Forest Preserve District harvests, cleans and stores seeds from up to 100 species of prairie plants annually. The NIPES find that collecting seed from established local prairies is a valuable restoration practice. Fire is an essential part of a prairie ecosystem, and burn management is part of every prairie restoration plan. Some prairie plant seeds require the fire’s heat to crack them open; others need smoke. Purple coneflower seeds germinate more successfully after exposure to smoke. Teams of specially trained WCFPD staff administer controlled burns on approximately 2000 acres of forest preserve land each year. Burned areas appear scorched and barren, immediately following the burn, but lush green plants rapidly appear, and the area teems with diverse plant and animal life, within weeks. Every year, staff and volunteers spend countless hours in the field, collecting and sowing seeds, and removing invasives to convert former agricultural land back to tallgrass prairie that will link the remnant habitats into a 3,000-acre interconnected system – one of the largest and most biologically diverse grasslands in Illinois. We’re just beginning to learn the true value of prairies. They provide biodiversity that’s of great importance to our agricultural industry. Cycles of vegetation and systems of roots regenerate and secure our soil and water. Prairie habitat for vanishing wildlife and aesthetically rich landscapes make them precious remnants of the natural heritage in which our lives and culture are rooted. Our local prairies are in their full glory about now. Many are open for tours and celebrations, and offer guided hikes and other education opportunities. Here are a few you’ll enjoy visiting. Beckman Mill Park, Rock County, Wis., on Co. Road H. A nice example of an oak savanna restoration project. Volunteers working with the Friends of Beckman Mill and the Welty Environmental Center are helping transform brush, bramble, and a host of invasive species into the richly diverse native oak savanna ecosystem. Forbs like cup plant, pale purple coneflower and a rainbow of other species bloom throughout the Big Bluestem and Indian Grass. Asters and Goldenrods signal the coming of autumn. Deer Run Forest Preserve, Winn. Co. Forest Preserve District, 5691 River Road, Cherry Valley, Ill., wcfpd.org. Deer Run’s 594 acres on the south branch of the Kishwaukee River contain hundreds of acres of restored prairie, woods, floodplain wetlands and ponds. The rare and secretive Henslow’s Sparrow (right) breeds in the lush prairie, one of 13 sparrow species seen here. Elmoville Prairie, Northern Illinois Prairie Enthusiasts, Jo Daviess County, located 4 miles southwest of Stockton, in Jo Daviess County, on the west side of Elmoville Road, nipes.org. This 3-acre remnant dry mesic prairie has an especially large number of plant species. Freeport Prairie Preserve, Jane Addamsland Park Foundation, Stephenson County. From Freeport at the junction of Bus. Hwy. 20 (Galena Avenue) and South Street, take South Street west 1.1 miles to Walnut Road, then turn south and go 0.25 miles. An Illinois Nature Preserve, this tiny 6-acre remnant represents the last of the original upland prairie known as Shannon Prairie. The prairie lies on a steep, north-facing bluff on the edge of an ancient channel of Yellow Creek. Most of the bluff contains high quality, undisturbed prairie vegetation of the Rock River Hill Country Natural Division. Many beautiful forbs add to the diversity. Downy yellow painted cup, prairie smoke (left), rock sandwort, and pasque flower are among the more unusual flowers. Hanley Savanna, The Northern Illinois Prairie Enthusiasts, 9417 Whitton Road, Hanover, Ill., nipes.org. This 160-acre prairie is located two miles southwest of Hanover in Jo Daviess County. It contains examples of dry sand prairie, sand blowout, mesic bur oak savanna, mesic black prairie, dry black oak savanna, wet sand prairie, and wet mesic woodland. It’s an excellent area for observing native prairie plants and grassland birds. Harlem Hills Nature Preserve, Illinois Department of Natural Resources, on Flora Drive in Loves Park, off the intersection of Forest Hills and Windsor roads, idnr.org. This 53-acre gravel prairie contains a large number of plant species, including several that are threatened or endangered in Illinois. This is Illinois’ largest and finest remaining example of a gravel hill prairie and is regarded as one of the 10 most significant prairies east of the Mississippi River. 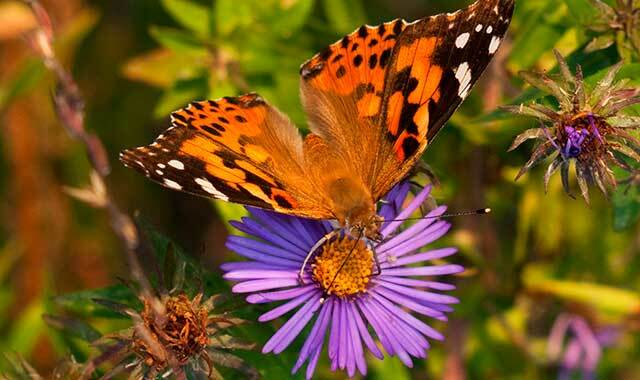 Plant and wildlife species are diverse and include several insects that are threatened or endangered in Illinois. A remarkable feature of this preserve is the large number of prairie wildflowers. In fall, beautiful plants include cream indigo, leadplant, pink milkwort, downy yellow painted cup and prairie buttercup. Here, the regal fritillary (right) feeds on milkweeds, thistles, and other prairie flowers. This butterfly is endangered in northwestern Illinois, its range mostly coinciding with a band of sandy, original, true prairie. Jarrett Prairie Nature Preserve, Byron Forest Preserve District, 7993 N. River Road, Byron, Ill., Ogle County, byronforestprserve.com. This high-quality prairie preserve exists within a larger 450-acre prairie restoration. The ridges and swales of the nature preserve are defined by the shallow underlying dolomite. Dry prairie is present on the thin soils of the ridges and upper slopes. Lower slopes and swales have moister soils. The nature preserve also includes two sites where large bur oaks with spreading branches suggest a savanna-like community. Nachusa Grassland Preserve, The Nature Conservancy, 8772 S. Lowden Road, Franklin Grove, Ill., Ogle County, Ill., NachusaGrasslands.org. This 3,000-acre preserve is owned and managed by The Nature Conservancy, a private, non-profit charitable organization. This is a private property that’s open to the public every day from dawn to dusk. An ideal time to visit is the third Saturday of September, during the annual Autumn on the Prairie festival. Norman Jensen Forest Preserve, Winnebago County Forest Preserve District, 4400 S. Bluff, Rockton, Ill, wcfpd.org. The preserve includes about 10 acres of dry prairie, on a gravel bluff above the river, where it makes a sharp bend below the dam. The prairie was identified 50 years ago by Dr. Egbert Fell, author of the Flora of Winnebago County. He documented several rare plants at the prairie, including one of the only known populations in Illinois of the state-endangered dragon wormwood. This is a favorite roosting area for bald eagles and osprey that fish along the river. Watch, too, for hawks, owls, great blue herons and sandhill cranes. Nygren Wetland Preserve, Natural Land Institute, 3190 W. Rockton Road, Rockton, Ill., in Winnebago County, naturalland.org. This private preserve offers public access to the Diane Nora Nature Trail and the Anne Meyer Memorial Prairie Garden, the former from Rockton Road across from Hansberry Road. Park in the overlook parking lot and follow the trail to see the prairie garden. NLI hosts annual events at Nygren that provide excellent prairie flower viewing and education about this upland mesic prairie restoration. A prairie celebration is held in late July each year. 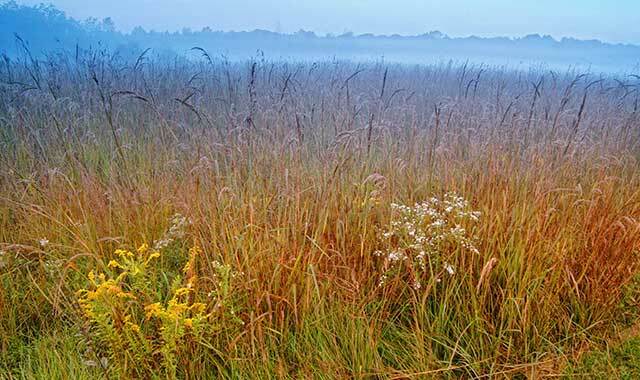 Reiner-Smith Prairie, owned and managed by the Prairie Enthusiasts, Dane Co., Wis., consists of a drumlin hill with original prairie sod with native wildflowers and grasses. Drumlins are long, narrow whale-shaped hills that were formed by the last Wisconsin glacier. This part of southern Wisconsin has large numbers of drumlins, many of which originally contained prairie. The preserve harbors over 100 native prairie plant species, including stunning displays of cylindrical blazingstar, rough blazingstar and bird’s-foot violet, a healthy population of the federally threatened prairie bush- clover, and, in a few locations, species typical of very rare mesic prairie, such as prairie lily, rattlesnake master, rosinweed, and compass plant (right). In addition, the preserve is home to eight species of prairie-dependent leafhoppers. The 40-acre site, all in grass cover, also supports grassland bird species that have been in severe decline over the past 40 years or more, such as eastern meadowlark, bobolink, and grasshopper sparrow. Reiner-Smith Drumlin Prairie is open to the public for hiking, bird-watching, and other low impact outdoor activities. Searls Prairie Nature Preserve, Rockford Park District, 4650 Safford Road, Rockford, Ill., Rockfordparkdistrict.org. This 66-acre prairie is a significant black-soil prairie containing wet and wet-mesic prairie representative of the Rock River Hill Country Natural Division. Mesic prairie is the main natural community in the preserve. Dominant grasses are prairie dropseed, Indian grass, and little bluestem. The wet prairie is dominated by tussock sedge, blue-joint grass, and cord grass. Sugar River Alder Forest Preserve, Winnebago County Forest Preserve District, 10255 Haas Road, Shirland, Ill., is an excellent example of sand prairie habitat. Sugar River Alder is a 538-acre tract of sandy soil which harbors unique habitats not found in other regions of the county. It contains an Illinois Nature Preserve. In its northeast corner is a small Class A remnant prairie. There are 5 miles of trails on relatively flat terrain. Douglas E. Wade Prairie, Prairie Preservation Society of Ogle County, Crestview Road, Byron, Ill., is about 11 acres largeand represents the original dry-mesic gravel prairie and dry-mesic dolomite prairie communities of the Freeport Section of the Rock River Hill Country Natural Division. It lies on a low Rock River valley bluff. Loess (windblown silt) covers the till, providing rich, well-drained soil for plants. The characteristic dry plant community of dolomite prairies includes porcupine grass, leadplant and wild indigo. The gravel prairie is dominated by side-oats grama and little bluestem. Several small mammals, reptiles and ground nesting birds live here. This entry was posted on Friday, September 6th, 2013 at 12:00 pm	and is filed under Features, Top Posts. You can follow any responses to this entry through the RSS 2.0 feed. Both comments and pings are currently closed.